Implants have revolutionized dentistry. Dental Implants allow patients the ability to replace one or several teeth by titanium screws that fuse intimately into the jaw bone. Dr Edward R Kusek has been placing implants for over 25 years and is well regarded by other dentist regionally and nationally as one of the leaders of Implant Dentistry. In fact, Dr Kusek is the only board-certified Implantologist in the Sioux Falls area. Whether it be due to trauma, infection, or if it was missing from birth sometimes teeth have to be replaced. 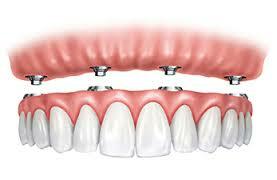 Replacing teeth with implant crowns is one of the many things we pride ourselves on excelling at. We use top of the line materials and technology to ensure the implant is placed in the optimal position and that the tooth will look as natural as possible so that you won't be able to tell a difference between the teeth! The new standard of care for patients needing dentures. Gone are the days of having to deal with denture adhesive or dentures falling out while chewing or talking. By placing two to six implants, depending on the amount of bone in each jaw, it allows conventional dentures to snap into the jaw and provide substantially increased rigidity and stability. The most aesthetic and comfortable option for patients requiring dentures. Fixed implant dentures provide an intimate relationship between the denture and gum tissue, so there is no additional pink acrylic covering the top or floor of the mouth. Since this type of denture is only removable by the dentist it often feels and looks nearly identical to natural teeth, especially when it comes to chewing and speaking.